Imagine how you'll feel when you don't have to worry about the cost of your pet's veterinary care! That is the whole idea of the new plans we are offering. Read all about them below, or if you would like to sign up or have the packet mailed to you, please fill out your information. We look forward to having you on board as a member! To sign up now, you can download the contract here. Yes, Please Call Me or Send Me More Information About The Pet Care Plans! 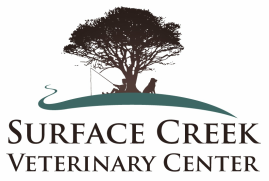 As I sit here watching my Lhasa Apso, Benji, stretched out in a state of bliss on the floor, I thank my lucky stars (and his) for Surface Creek Veterinary Center and their incredible Pet Care plans. When I visited SCVC for the first time early on a Monday morning with Benji, only to learn that he required somewhat urgent abdominal surgery, I knew in my heart that I was faced with having to have him put to sleep as I’m on a fixed income with little or no wiggle-room. Much to my relief, Dr. Jeff handed me their Pet Care Plan brochure and thanks to their Platinum plan, Benji ended up with not only a repaired abdomen but also the removal of 4 broken teeth and a cleaning! For that same monthly payment he’s still entitled to all his annual vaccines, unlimited vet visits and toenail trims, heart worm prevention and de-worming to name just a few. Thank you, Drs. Jeff and Susie for taking such great care of both Benji and me – you can be sure I’ll be spreading the word throughout the area that you are the go-to veterinarians in every way! Just think, with this plan all the basics are covered, and you don't have to worry about it! This membership includes a 5% discount on any additional purchases during the year, and represents a 15% discount off regular prices. And the cost for this plan is just $16 per month for cats, and $19 per month for dogs! This is THE best way to find any hidden problems early, BEFORE your pet is sick. Imagine knowing your pet is going to be getting the same care you get every year, and again, with no worrying on your part! This membership includes a 10% discount on any additional purchases during the year. This represents a 20% discount off regular prices. The cost for this plan is only $32 per month for cats, and $36 per month for dogs! NO emergency fees for after hours "surprises"
This is the plan for the pet lover who doesn't want to worry about anything except the best care for their pet(s)! This membership level includes a 15% discount off any additional purchases during the year, and represents at least a 25% discount off of regular prices, but could be much higher depending on how often you're in to visit us! With this premium plan you will also receive an invitation to four special events sponsored by the clinic throughout the year, as well as a special welcome package just for you and your furry friend! The cost for this package is only $99 per month! If you have a second animal that you would like to buy a plan for as well, you'll receive that plan at a discount, which varies with the membership of the first pet. There is a one time sign-up fee of $15 for all of the plans, and we will bill your credit or debit card on the first or 15th of every month. What could be easier than that? Of course you don't have to sign up for any of the packages, and you will still receive the same great service. We would love to answer any additional questions you may have about these plans, just call the office or come in and we would be happy to help you sign up!